Following are some of the photos from our first trip to the Grand Canyon. We started in Scottsdale, Arizona for some Spring Training baseball with our friends Neil and Abby. Then, Jim and I took a morning trip to the Grand Canyon, followed by an afternoon drip to Sedona, Arizona for some offroading in Jeeps. Overall, it was a fun trip! While in Phoenix, Arizona for a couple of Cubs Spring Training baseball games, we stayed at the Doubletree Hotel. Here, we’re standing on the balcony at the hotel, with Arizona palm trees behind us. Abby was on a mission to find “the desert”… We drove for miles in every direction, but never came across the desert — as we had imagined it would be, anyway. In fact, it was quite rainy in the desert while we were there, so everything was really green and flowery. En route to the Grand Canyon for our day-trip from Phoenix, we spotted the “World’s Largest Kokopelli” near Sedona. Everywhere you turn in Arizona, there’s a ton of Kokopelli souvenirs. He’s quite the “dude” around there! This Guy Helps Ya Get Pregnant? UPDATE: I can testify to the fact that Kokopelli’s magical powers had no affect on me. We bought 2 Kokopelli items as souvenirs from our trip to Arizona (a cast iron candle holder and a tiny Kokopelli figurine. We had been trying to get pregnant for several years. But it didn’t work for us. 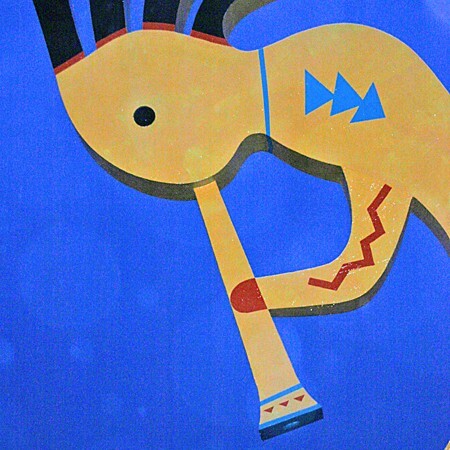 We must have bigger issues than the mighty Kokopelli could handle! 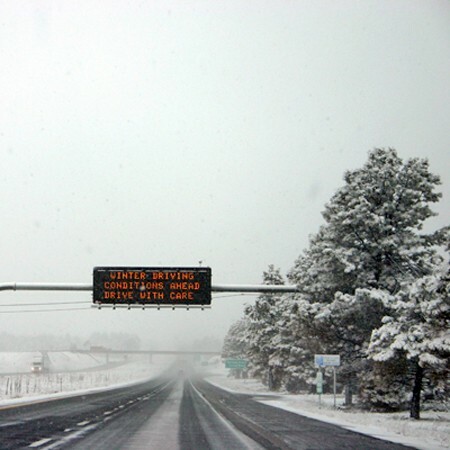 Winter Driving Conditions… In Arizona! No wonder we couldn’t find the desert anywhere! Actually, the farther north we drove from Phoenix to the Grand Canyon, the higher the elevation got. The highest we got was 7,350 feet above sea level! This was March 6, 2005. 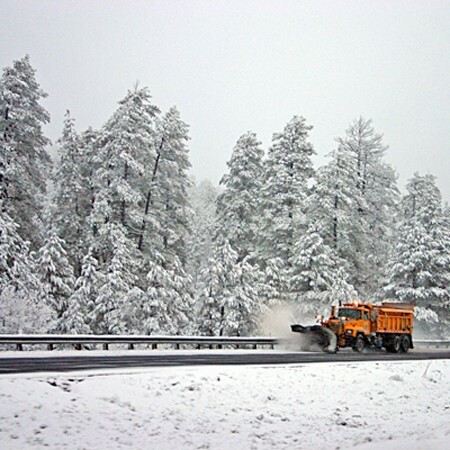 What a surprise when we went from 50 or 60 degrees just down the road at the “World’s Largest Kokopelli” to THIS: an Arizona Blizzard! It was a terrible snow storm that struck completely out of the blue. Guess they’re somewhat prepared for it though… they had this sign to give us a heads up. We were halfway from Phoenix to the Grand Canyon. As soon as the snow fell (like a blanket! ), we realized that we were 7,350 feet above sea level… on a twisty moutain road UP! And we began to fear our drive back down that hill. We almost turned around. Until we finally spotted a whole fleet of snow plows. It seems they’re very well equipped for sudden snow storms like this. 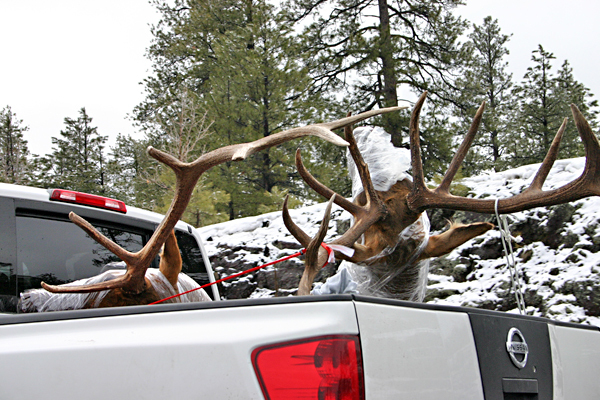 Check Out The Rack On These Two! We knew we barely had any time to spend at the Grand Canyon, so if we at least wanted to catch a glimpse of this natural wonder, we had to leave our hotel at 3:00 in the morning and drive straight there… take our photo… and leave! We had an appointment back in Sedona for 11:00 a.m. The surprise blizzard, and the fact that we were so tired & had to stop for a nap didn’t help matters any. Oh well, we got what we wanted: Our “Chevy Chase” Kodak moment. This was the only view of the Grand Canyon that we had time for on this day. It’s the first stop you come to after entering the National Park — called Mather Point at the South Rim. First, we had someone take our “Chevy Chase” photo, then we turned around and took this photo with the Grand Canyon behind us. This, My Friends, Is The Grand Canyon! 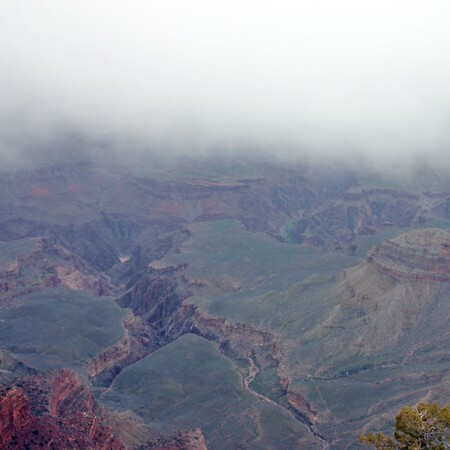 It was a very dreary morning at the Grand Canyon — March 6, 2005. This was as good as it got at the South Rim of the Grand Canyon. As soon as we wrapped up our little photo session, the clouds came barreling in, and we were thankful that we managed to snap the photos we did! Despite the poor visibility, the Grand Canyon is still one of the most fascinating scenes in the world! This was the last picture we snapped before the thick clouds and rain gathered overhead. You could bare even tell there was a Grand Canyon down there! After our day at the Grand Canyon and Sedona 4wheeling, we met up with Neil & Abby that evening for a night on the town in Scottsdale, Arizona. We had dinner at The Pink Pony (though the atmosphere is more exciting than the food). Then we had drinks at Patty’s (a sports bar of sorts).